Today, Southland Holdings is a multifaceted heavy civil construction firm active throughout North America, building virtually any structure for to facilitate and protect the movement of people, water and wastewater. We are currently the 33rd largest heavy civil contractor in the United States and one of the largest in Texas. 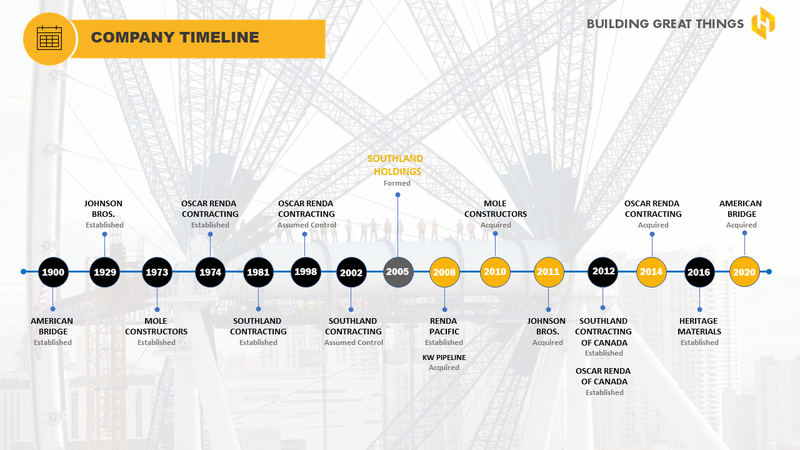 The history of Southland Holdings is one of powerful companies joining together to create a multi-faceted force in construction. While they began in different places and at different times, as early as 1930, our component companies have always been noted for working harder and working smarter while upholding a reputation for integrity and resourcefulness. Today, Southland Holdings is managed by leaders in the industry. The next generation of our founders builds on their success and provides unwavering clarity and continuity of purpose. We are active in 42 U.S. states and in two Canadian provinces. With additional completed projects in Kuwait, Saudi Arabia and Nigeria, we have successfully executed more than $9 billion dollars of work, growing to more than 2,000 dedicated full-time employees. Oscar Renda Contracting, Inc. was established by Oscar Renda in 1974. His brother, Rudolph J. Renda joined the business a few years later. Having immigrated to the United States in 1956 as young boys with their family of two parents and five sons, their strong work ethic was born out of a desire to give back in appreciation for all this great country had given them in opportunity. Oscar, being a high school football coach and U.S. History teacher, took out a teacher’s credit union loan for $13,000 in September of 1974. Over four decades later and several billion dollars of heavy civil work completed, Oscar Renda Contracting is the foundation which helped create what Southland Holdings is today. Southland Contracting, Inc. was established in 1981 by Charlie Griffith. Charlie was a true mechanical genius and could design, engineer, and build tunnel boring machines. This gave him a very strong competitive advantage which allowed him to innovate and grow his tunneling company into a strong force in the industry. His integrity, intelligence, and sheer strength of will continues to provide inspiration for all of the employees of this great company. Charlie’s son, Clay Griffith, helps continue the legacy of innovation and successfully completing some of the most difficult and challenging tunneling projects in the world. Johnson Construction company was established in 1929 by Walter D. Johnson. Through several family generations and numerous triumphs and challenges, the fortitude of the company has been strengthened through the faith, grit, and resolve of the family’s leadership and the company’s hard working employees. A leader in the industry with over 85 years of experience specializing in Bridge, Highway, Infrastructure, Marine, Industrial and Emergency Construction services for both public and private clients, Johnson Bros is poised to excel for decades to come building on the traditions established by the company’s founders and leaders. Mole was founded by Victor Scaravilli in 1974 to specialize in tunneling throughout the United States and Canada. Victor, a graduate civil engineer, contributed numerous new and innovative approaches to the tunneling industry. Victor is the inventor of the Jarva Hard Rock Tunnel Boring Machine (now the Robbins Company) and holds several patents. Mole has very specialized knowledge, expertise, and skill in the tunnel market. This provides dynamic capabilities rarely available in the industry allowing Southland Holdings to take on the most complex underground challenges and bore through them successfully. We hold the well being of people above all. Everyday we are committed to the safety process so we can send our team home to their families, safe and sound. We do the right thing. We conduct our business with the highest standards of professional behavior and ethics. For instance, the invention of the Hard Rock TBM. But even as we work on each project, we are constantly searching for ways to increase performance and quality. We work harder and smarter than anyone else. There is no limit to our capability. We never give up, especially in the face of resistance while working in some of the most challenging conditions. We strive to excel in every aspect of our business delivering the highest quality and value for our clients. Frank grew up working in his family’s construction business, Oscar Renda Contracting, Inc., eagerly learning the trade from his father and uncle. After graduating from Texas Tech University, he returned to the family business as a field supervisor. Years of hard work and an unswerving dedication to quality earned Frank the title of General Manager. At that time, the company was a local utility contractor with around 100 employees. The business boomed under Frank’s visionary direction, expanding into nearly two dozen states, acquiring 2,000 employees, and growing from $20 million to over $550 million a year in revenue. Today, Frank serves as CEO of Southland Holdings, one of the largest construction companies in North America with licenses in over 30 states. He offers nearly three decades of project management experience and has worked on projects from Maryland to California. Jarrod heads the finance, accounting, tax and treasury functions for Southland Holdings LLC and all its subsidiaries. He emphasizes maintaining Southland’s strong financial health while driving value for its ownership. He is leading the company through the development of strong internal controls and processes to maximize efficiency and fidelity in financial reporting. During his almost 20 years of experience, Jarrod has worked for large Fortune 500 companies such as Yum Brands (Pizza Hut) and McKesson as well as smaller privately held companies like CROSSMARK (a leading CPG sales and marketing company). He has lived and worked on four continents, leading finance teams and organizations, driving processes and functions like budgeting, forecasting, financial analysis, M&A, sales compensation and system implementation, to name a few. In 2003, Jarrod graduated in the Top 5 percent of his class while receiving his Master of Business Administration from the Owen Graduate School of Management at Vanderbilt University. In 2004, he passed the CPA exam and is licensed in the state of Tennessee. Prior to attending Vanderbilt, Jarrod received his Bachelor’s Degree in Biology from the University of Texas at Arlington, which led him to work for three years in a genetics lab with Orchid Biosciences. Tim began his construction career in 1991 working on a survey crew in Longview, Texas. After graduating from Texas Tech University with dual degrees in Finance and Economics, he joined Frank and Rudy Renda at their family’s business, Oscar Renda Contracting, Inc.
As the construction firm was growing into the leading Texas-based provider of water and sewer infrastructure, Tim took on their first large-scale out-of-state project in North Carolina. His devotion to ensuring successful project completions and going beyond client expectations helped him expand the business into 21 states. Tim’s responsibilities as part of Southland Holdings’ executive leadership include efficiency reviews, resource management, equipment procurement, and partnering strategies. He has worked on projects from New York to Hawaii and continues to coordinate work between job sites across the nation. Russell is in the business of growing strong, competitive companies. He believes in open communication with clients and goes the extra mile to solve issues that may arise during a project’s lifecycle. Russell holds a Construction Science degree from Texas A&M University and an Executive Master’s degree in Business Administration from Southern Methodist University. He has honed the skills he learned in the classroom on the field and in the office, providing exceptional operations management and expert construction industry knowledge. Today he supervises the daily operations of a 280-employee company that generates over $160 million a year in revenue. Growing up around his family’s construction firm, Rudy can remember being on job sites since the age of three, learning from some of the best and hardest workers in the business. He graduated from Texas Tech University and joined Oscar Renda Contracting, Inc., as a field supervisor, working alongside his cousin Frank Renda. Rudy has spent almost 30 years leading various heavy underground projects including pipelines, tunnels, water and wastewater treatment plants, and marine work. As part of Southland Holdings’ leadership, he is responsible for overall operational performance at the Southland family of companies. Whether he is working on safety enforcement, budgeting, or nationwide job site coordination, Rudy is determined to lead by example and exceed client expectations.